22. And straightway Jesus constrained His disciples to get into a boat, and to go before Him unto the other side, while He sent the multitudes away. By saying "constrained", Matthew suggests how inseparable the disciples were from Jesus, for they wanted to be with Him at all times. He sends the multitudes away, not wishing to draw them after Him lest He appear to vaunt in His powers. 23-24. And when He had sent the multitudes away, He went up onto a mountain apart to pray: and when the evening was come, He was there alone. But the boat was now in the midst of the sea, tossed with waves: for the wind was contrary. He went up on the mountain to show that we should pray in an undistracted manner; everything He did was for our sake as He Himself had no need of prayer. He prayed on into the evening, teaching us not to cease praying after a short time, and also to pray especially at night, for it is very quiet then. He permits the disciples to be caught in a storm, so that they might learn to endure trials bravely and know His power. The boat was out in the very middle of the sea so that their fear would be greater. 25-27. And in the fourth watch of the night Jesus went unto them, walking on the sea. And when the disciples saw Him walking on the sea, they were troubled, saying, "It is a spirit;" and they cried out for fear. But straightway Jesus spake unto them, saying, "Take courage; it is I; be not afraid." He did not appear immediately to them to calm the storm, but at the fourth watch, [that is, as the night was coming to its end], teaching us not to ask for a swift solution to our misfortunes but to endure them bravely. The night was divided into four parts by soldiers who stood guard in shifts, each "watch" lasting three hours. So then, sometime after the ninth hour of the night, the Lord appeared to them as God, walking on the water. But they thought it was a phantom, so extraordinary and strange was the sight. For they did not recognize Him by figure, because it was night and because of fear. He first strengthens their resolve by saying: "It is I Who can do all things; take courage." 28. And Peter answered Him and said, "Lord, if it be Thou, bid me come unto Thee on the water." As Peter had the most fervent love for Christ, he desires immediately, before the others, to be near Him. For he believes not only that Jesus Himself walks on the water, but that He will grant this to him as well. Peter did not say, "Bid me to walk," but rather to "come unto Thee". The former would have been ostentation; the latter is love for Christ. 29-30. And He said, "Come." And when Peter was come down out of the boat, he walked on the water, to go to Jesus. But when he saw the mighty wind, he was afraid; and beginning to sink, he cried out, saying, "Lord, save me." The Lord laid the sea down beneath Peter's feet, revealing His power. 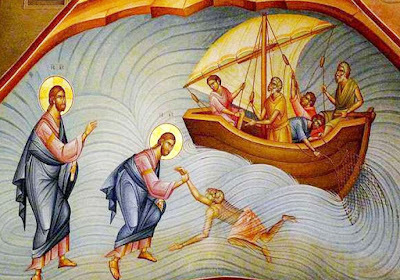 See how Peter prevailed over that which was greater, the sea, but was afraid of the lesser peril, the wind; such is the weakness of human nature. And it was as soon as he became afraid that he began to sink. When his faith weakened, then he went down. The Lord did this so that Peter would not become puffed up, and to console the other disciples who perhaps envied him. Whereupon Christ also showed how much greater He was than Peter. 31-33. And immediately Jesus stretched forth His hand, and caught him, and said unto him, "O thou of little faith, of what didst thou doubt?" And when they were come into the boat, the wind ceased. Then they that were in the boat came and worshipped Him, saying, "Of a truth Thou art the Son of God." Showing that the cause of his sinking was not the wind but faintheartedness, Christ does not rebuke the wind, but the fainthearted Peter. This is why He raised him up and set him on the water, but allowed the wind to blow. Peter did not doubt in everything, but in part. Inasmuch as he was afraid, he showed lack of faith; but by crying out, Lord, save me, he was healed of his unbelief. This is why he hears the words, "O thou of little faith", and not "O thou of no faith." Those in the boat were also delivered from fear, for the wind ceased. And then indeed, recognizing Jesus by these things, they confessed His divinity. For it is not an attribute of man to walk on the sea, but of God, as David says, "In the sea are Thy byways, and Thy paths in many waters" [Ps. 76:19]. The spiritual meaning of the miracle is this: the boat is the earth; the waves, man's life troubled by evil spirits; the night, ignorance. In the fourth watch, that is, at the end of the ages, Christ appeared. The first watch was the covenant with Abraham; the second, the law of Moses; the third, the prophets; and the fourth, the coming of Christ. For He saved those who were drowning when He came and was with us so that we might know and worship Him as God. See also how Peter's later denial, return, and repentance were prefigured by what happened to him here on the sea. Just as there he says boldly, "I will not deny Thee", so here he says, "Bid me come unto Thee on the water." And just as then he was permitted to deny, so now he was permitted to sink. Here the Lord gives His hand to him and does not let Him drown, and there, by Peter's repentance, Christ drew him out of the abyss of denial. 34-36. And when they had crossed over, they came to the land of Gennesaret. And when the men of that place had knowledge of Him, they sent out into all that country round about, and brought unto Him all that were diseased; and besought Him that they might only touch the hem of His garment: and as many as touched were made perfectly whole. Jesus stayed for some time in Gennesaret, and the people recognized Him not only by sight but by the signs which He worked, and they showed fervent faith. So much so that they even desired to touch the hem of His garment, and indeed, when they did so, they were healed. You also, O reader, touch the edge of Christ's garment, which is the end of His sojourning in the flesh. For if you believe that He ascended, you will be saved. The garment means His flesh, and its hem, the end of His life on earth.